Last Sunday, December 4, 2016, was the second annual Cabernet Franc day. There are celebratory days for several popular wine grape varietals throughout the year. However, the regal Cabernet Franc grape had been overlooked until 2015. Enter Lori Budd. She and her husband, Michael, are the proprietors of Dracaena Wines in Paso Robles, California. Much more than a winery owner, though, Lori is a champion of Cabernet Franc. To bring attention to this oft overlooked grape, she established December 4th of each year as Cabernet Franc day. You can read Lori’s story about the creation of Cabernet Franc day here. Cabernet Franc is a grape many wine drinkers have never heard of. Of those who are aware of it, many know it only as a blending grape used in red Bordeaux wines. Surprisingly few people have experienced Cabernet Franc as a stand-alone wine. That is a shame, and Lori is doing all she can to remedy that problem. While anybody who has taken even a passing notice of wine is familiar with the King of Grapes, Cabernet Sauvignon, many do not know that Cabernet Sauvignon is a naturally-occuring hybrid. DNA testing in the 1990s revealed it is a cross between Cabernet Franc and Sauvignon Blanc. So what happens on Cabernet Franc day? A lot! Social Media is inundated with hashtags like #cabfrancday, #cabfranclove, and #lovecabfranc. 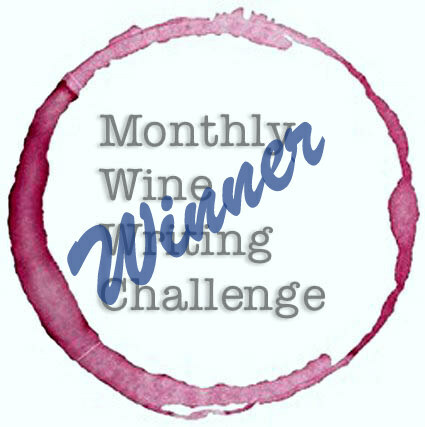 In the wine blogger community, blog posts about Cabernet Franc abound. The day culminates with a Tweet-up on Twitter, with the hashtag #cabfrancday. I participated in the Tweet-up – my first one ever – and it was a lot of fun, and very informative! I had no idea there were so many producers making stand-alone Cabernet Franc, in so many styles. I’ve had a few Cab Francs before, but haven’t really explored the grape in depth. All the wines I’ve had have been excellent; medium bodied with black fruit, tobacco, and spice, with the classic bell pepper on the finish. It is a very food friendly wine, and pairs well with basically anything you would serve with Cabernet Sauvignon or Merlot. 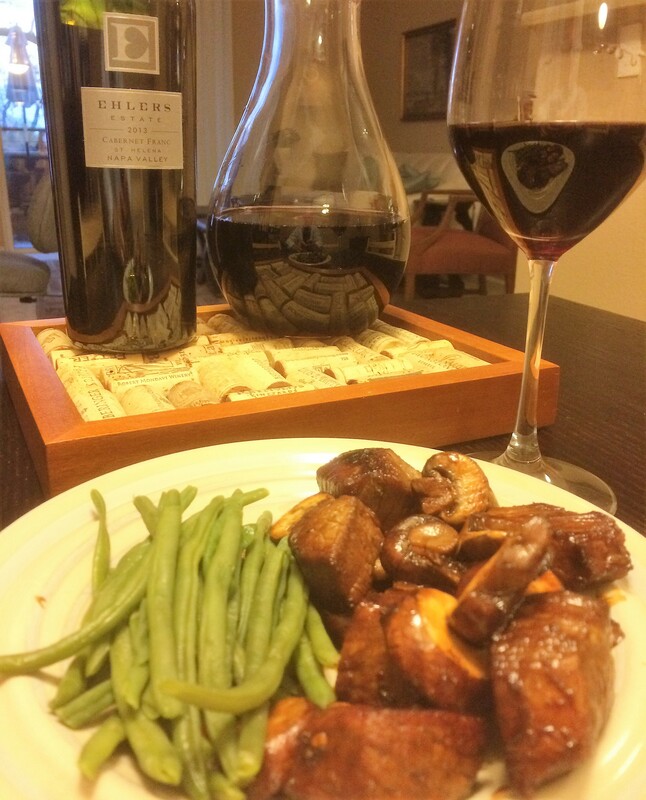 Cab Franc Loves Beef Tips and Mushrooms! 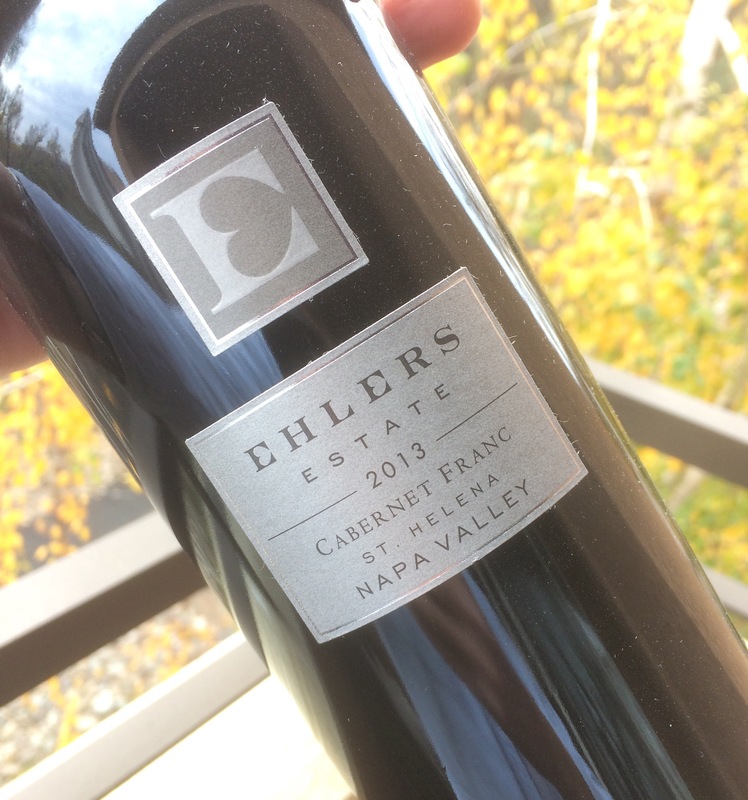 To celebrate Cabernet Franc day, I had the good fortune to receive a bottle of Ehlers Estate Cabernet Franc 2013, from Beth, the Traveling Wine Chick. 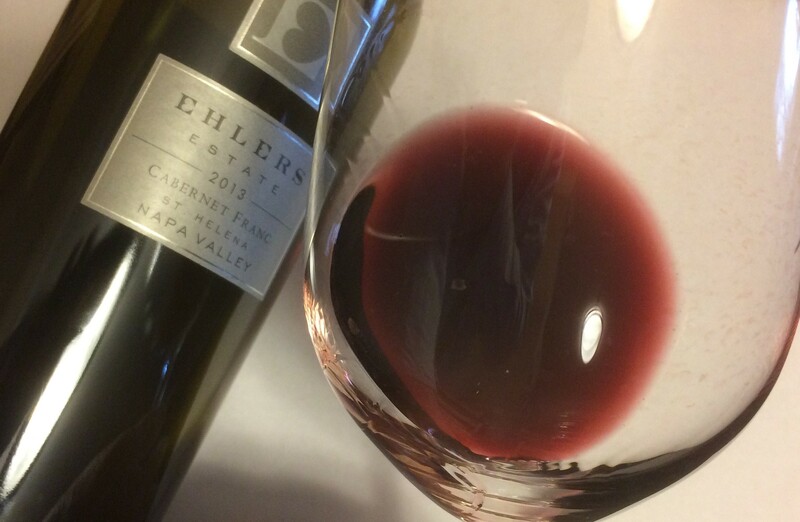 The Ehlers Estate Cabernet Franc will blow your mind! 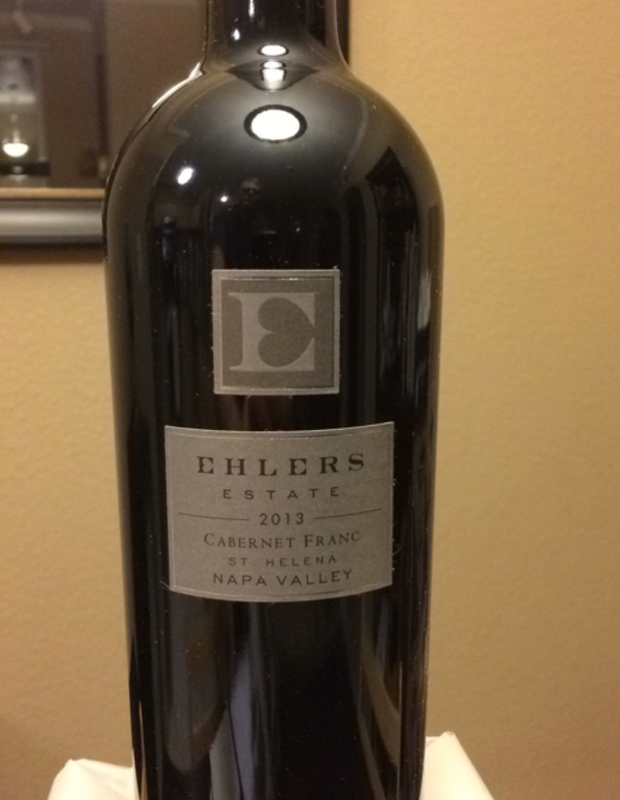 It is crafted from 100% Cabernet Franc aged in 100% French Oak, and is rich, deep, and full bodied. A beautiful, 100% Cabernet Franc with great structure, firm, mature tannins, and compelling flavors. Black and red berries, black cherry, toasted coconut, browned butter, and slight vanilla, this wine is pure Franc from a stellar terroir. Mouth-filling and built to last, with a long chewy finish, this is a perfect change-up to your best Cabernet Sauvignons. Off the charts. A delicious way to enjoy #CabFrancDay! Deep purple with a ruby rim. Aromas of ripe raspberry and soft cedar and pencil shavings. As the wine opens up, I got a whiff of bell pepper, too. On the palate, this is a juicy, balanced delight. Ripe raspberry, blackberry, cedar, and spice. Tannins are soft and smooth, with vibrant acidity that makes my mouth happy! The finish is long and satisfying, with black and red fruit. Outstanding! With such famous lineage it is surprising that Cabernet Franc is so often overlooked and forgotten. If you haven’t tried this grape on its own, please go to your favorite wine shop now and buy some. Then join us every December 4th for the annual #cabfrancday festivities! At last! Someone giving Cab Franc the recognition it deserves! Keep enjoying! There are some great examples from the Loire Valley in France, too: Chinon, Saumur-Champigny, etc. I agree, Ian! All credit to Lori at Dracaena Wines! I am looking forward to more exploration and trying some of those Loire Valley wines! Cheers! Thank you so much for your post. I am sorry I am just seeing this now. I appreciate your support for CabFrancDay! My pleasure, Lori! Keep up the great work!